Lizzie Orchard from New Zealand, took the win at XTerra Albay in the Philippines last Sunday 8th Feb. Learn more about this off-road triathlon specialist who has two amateur world champion titles under her belt and get inspired for your next XTerra event! Sponsors: Robert Harris, Leppin Sport, EVOC, The Tooth Fairy, Asics. Can you tell us about your background in the sport and your next goals? I’ve always been interested and competed in sport. Swimming as a youngster then taking Track running to World Youth (Under 18) level at school. I started racing XTERRA as a team with my brother, neighbor, and friends for many years. In 2009 I decided to have a go at the full Triathlon, it was so much fun and I found the event so challenging yet rewarding I’ve never looked back. By 2012 I had progressed to being World Champ for my age group in XTERRA and ITU Amateur Cross Tri Champ. The next challenge was racing as a Pro while maintaining a full time job. Results were very promising so I decided in early 2015 to work part time and really explore what I can achieve with more training and racing under my belt. I’ve loved the journey so far and have racked up some results I’m very proud of, it’s made me hungry for more and optimistic about the future. 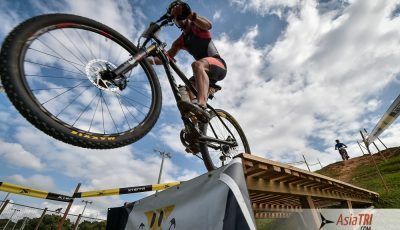 Next up on the race Calendar is XTERRA Rotorua, shortly followed by the XTERRA Asia Pacific Champs and XTERRA Malaysia. 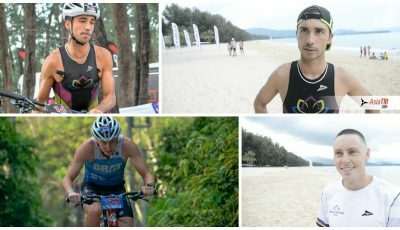 I’m aiming to perform well at all three for a high overall XTERRA Asian Tour ranking. What attracts you so much for the XTerra events compared to traditional road races? In my first XTERRA World Champs, I remember a particularly steep section of the bike course. Half the competitors were walking at this point, but a few (myself included) were able to power up the rocky bank. The athletes pushing their bikes were not only moving aside and calling ahead for walkers to move aside, but actually cheering ‘Good Job’ to those grinding up the hill. It’s this respect and comradely in the XTERRA community that I enjoy being among. Another great aspect to XTERRA is that Men, Women, Pros, and Age groupers usually race the same course at the same time. This means one big race day, with plenty of time to share stories and celebrate afterwards. I also like the fact that the races themselves are a test of individual skill – the field switches around so much during the race as drafting and ‘catching a group’ are not as advantageous as in traditional Road Tri. 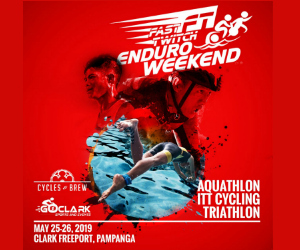 You had an amazing win at XTerra Albay, beating by over 2min Jacqui Slack, who knows the course well, how did your day go and what were the biggest challenges on the day? It was an early start at XTERRA Albay with a 4am alarm. Anyone that knows me well would agree that this was one of the biggest challenges of the day for me ! In terms of the race itself, the long climbs and descents required a lot of concentration, I was proud of myself to make it at a good pace. Another challenge was making a podium speech, having never done this before I was a bit nervous. I’m so happy that my first Pro win was at XTERRA Philippines. Was this your first time racing in the Philippines? What are your thoughts on the course, the race and the off-road scene in Asia? This was my first time visiting and racing in the Philippines. My partner and I spent three days sightseeing in Manila and another 3 in Legazpi before meeting up with most of the other pro racers at the race hotel. The welcome and hospitality we experienced from the people of Albay and Sunrise Events was second to none. Not only did we all have personal banners displayed throughout town welcoming us, we were met at the airport, transported as a team, introduced to the Governor, special pre race dinners arranged, the list goes on, it was amazing. The race course itself was a lot of fun. The 1 lap swim was really calm and I thought I was by myself in no mans land but was later to find I was only 10sec behind Mieko most of the way ! Jacqui had a great swim and had put about a minute and a half on us. We had done a practice ride a couple of days before so I knew there were a few very long hills to negotiate in the 1st half of the bike. After these, the course was undulating with some great trails through forest and past fresh (2006) lava ! There were crowds of locals cheering in the villages which I enjoyed a lot. The run was an adventure up Mt Mayon and down through a lot of small streams and rice paddys, I caught Jacqui about half way and was able to pull away towards the finish. Having done a few races in Asia now (Japan, Malaysia, Philippines), its easily seen how varied the courses, setup, and climates are. This leads to interesting races. With such well run exciting events its also no wonder the sport is growing with both local and international competitors. As an international, I love experiencing the different cultures, languages, and food ! That’s why I always try to spend some time in the region as well as racing. Can you describe a typical training week? 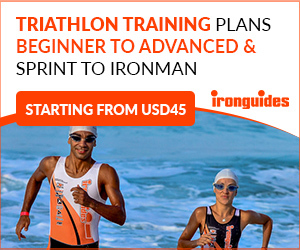 How does the training for an off-road race differs from traditional road tri-training? Each training week comprises of approx. 4 sessions each swim/bike/run. This is probably quite similar to Road Race training, but of course we also need to work on technical mountain bike, trail running, and bike mechanical skills – it’s a long walk home if you get a puncture out in the forest ! I also do transition practice the night before each event. This may sound a bit late – but it’s often not until briefing that complete details on drink stations etc are revealed. For example at XTERRA Philippines, it was a point to point ride with stations where you could refill your own drink bottle. This meant I chose to ride with hydration in my backpack, and had a practice at tipping my run gear out of a bag that we checked in night before the race.